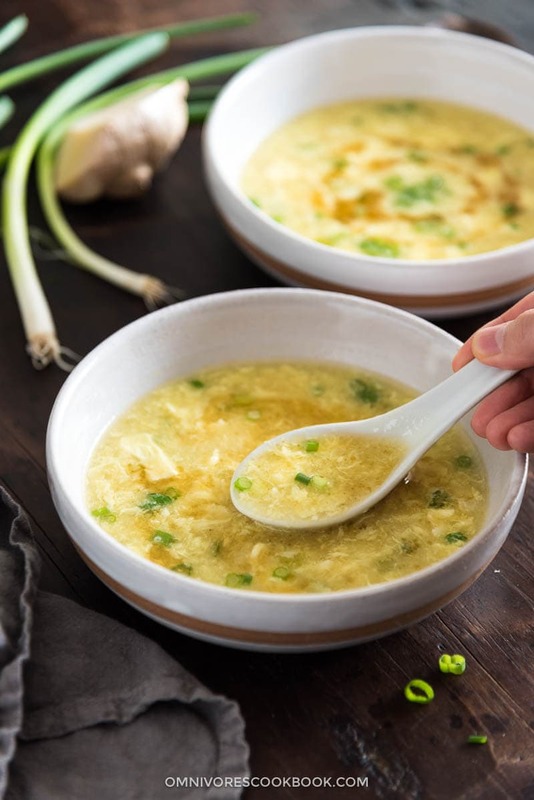 Make the restaurant-style Chinese egg drop soup with the minimum ingredients, within 15 minutes, and without any fuss. Soup is an important element on a Chinese family’s dinner table. Back in Beijing when I was living with my parents, my mom would serve soup every day along with steamed rice, stir fried seasonal vegetables and a meat dish. Egg drop soup was always her first choice. Cooking egg drop soup only takes 15 minutes, but you get a hearty soup that tastes way better than the one in Chinese restaurants. You don’t need to add tons of spices like star anise and cloves because it overpowers the delicate egg flavor. I was astounded to see some egg drop soup recipes call for 6 to 7 spices. It’s unimaginable. We’re cooking a quick side dish here, not Vietnamese pho. You only need some fresh green onions and ginger. That’s it. They bring out the sweetness of the egg without the taste being overwhelming. The key to make the soup more flavorful is to bring the soup to a boil and let it cook with the ginger and green onion for at least 10 minutes to release the flavor. That’s it. You don’t even need to chop the ginger. Just add a whole slice and you can fish it out and discard it before you serve the soup. When you’re ready to add the rest of the ingredients, turn down the heat to let the broth simmer gently. Whisk in cornstarch slurry to lightly thicken the broth. Then, slowly add the beaten eggs by using a fork to slow the flow. Let the eggs sits for a few seconds, then use a pair of chopsticks to break them apart to your liking. Drizzle with a few drops of sesame oil. You will get the most comforting soup with a silky texture and delicious eggs bits. 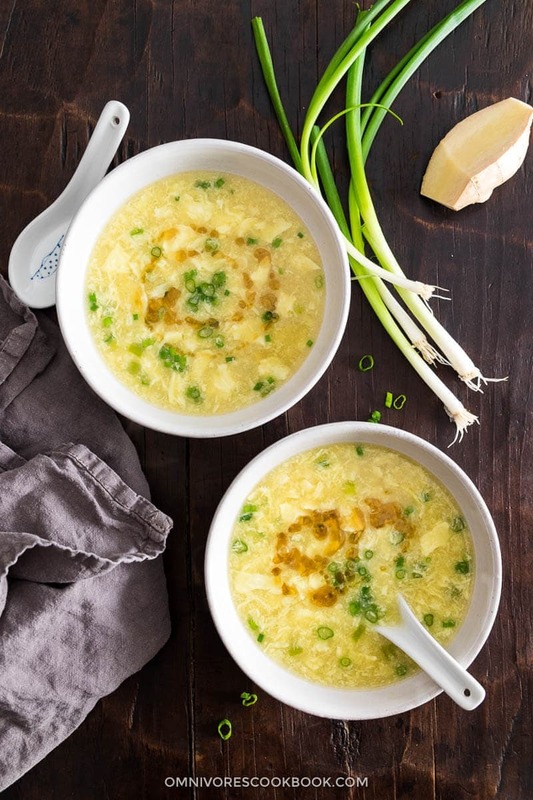 There is no fuss about making a hearty egg drop soup that tastes even better than the one in a Chinese restaurant. There are a few things you can do to make your daily soup taste a bit different. You can add a handful vegetables, such as bok choy, spinach, mushrooms, or cucumber (sounds weird, but it works). But remember that less is more. Add corn and peas to make it a corn soup (and you can add ground chicken to make it richer). Add a few soaked dried shrimp at the beginning, to infuse more umami flavor to the soup. My mom uses this method with some chicken bouillon when we don’t have chicken stock at home. If you use chicken stock and dried shrimp, the soup will taste even better. 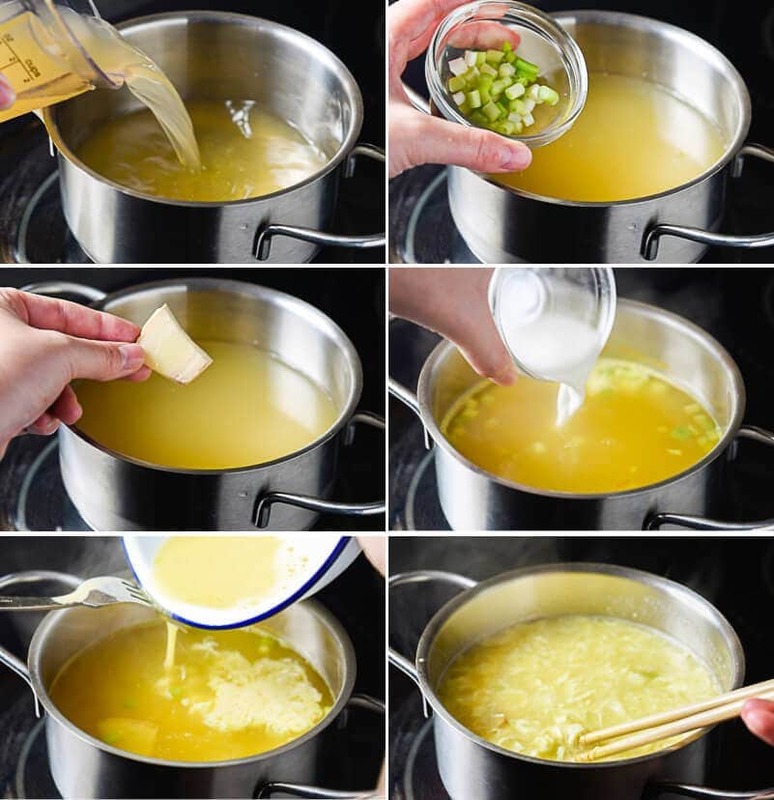 Combine the chicken broth, the white part of the green onion and ginger in a small pot. Cook over high heat until brought to a boil. Turn to a low heat and let the soup reduce to a simmer. Combine cornstarch, white pepper, turmeric, sea salt and 2 tablespoons of water in a small bowl. Whisk until cornstarch is completely dissolved. Swirl into the soup and mix well with a spatula. To add eggs, hold a fork (or two chopsticks slightly apart) across the top of a small bowl, drizzle the egg mixture slowly through the gaps into the soup. Let the eggs set for a few seconds, then stir gently to break up the egg to the desired sized pieces. Drizzle sesame oil and sprinkle with the green part of the green onion. Thank you so very much for this recipe! I want some simple, authentic egg drop soup SOOOOO badly right now! I’ve been living in SoCal for over 5 years now and have yet to find any restaurant serving this version. Worse yet, for me at least, most put canned corn in the soup, which becomes the only flavor I can discern. All the rest add meat and mied vegetables so the price is higher because they cannot afford to sell “cheap” menu items. [Most also sell egg rolls in large batches.] The one place that made a version I enjoyed (cabbage was only addition) was forced out of business when the landlord doubled his rent. Great family, great restaurant. I am so sad for them. It’s chilly out this week, so I will be whipping up a bowl in just a little while. I rarely order egg drop soup in a restaurant, because it’s so quick to cook at home. I guess I was spoiled with my mom’s cooking growing up! We do have a corn soup, which is the next kin to egg drop soup, but we use frozen corn and ground meat, which makes the soup quite rich. First time eating and making this dish. Absolutely wonderful. I added diced tomatoes and sliced mushrooms. Will try cabbage next time. One teaspoon of sesame oil is enough as two overpowered it. It’s a keeper. Hi Richard, so glad to hear the dish worked out for you! Noted about the sesame oil too! Had this wonderful soup for breakfast just this AM. Lite but filling with an English muffin. I’m getting hooked on all your recipes. I would like to make soup can I make it if I triple the ingredients? I volunteer at American legion and think this would really go over thanks. Made the basic recipe (except turned out I didn’t have any tumeric or white pepper, oh well there on my shopping list) had to adjust the measurements because I’m only cooking for one (me). It turned out great. I’m glad to hear you made my recipe and enjoyed it Michael! It is totally OK to skip the turmeric. It is only for the color and does not really add flavors. like you say….simple & so tasty! Easy & quick to make. I doubled the recipe, used my own homemade stock, and substituted ginger paste for fresh ginger slices. Definitely will make again. Hi Shelby, I’m so glad to hear you enjoyed this soup! My mom used to make it a few times a week, because it’s quick to make! So excited to find your website!! I am American born Chinese Singaporean and always thought Chinese food was very challenging to make (so much chopping and very precise technique). Hard to find a blog in English that is authentic Chinese. 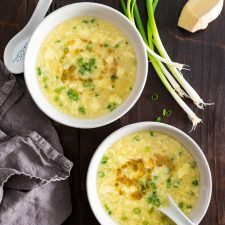 I love egg drop soup and can’t wait to be able to make it at home! Thank you! This is a great recipe. I could not get my egg to swirl . It did more of a bubble explode. How can I correct this for next time? What type of sesame oil did you use? Regular, refined, toasted? Could you make this in a Crock pot? I love EDS snd Id like to take it as a side to my friend’s Chinese New Year , dumpling party. Im also thinking about the okra. It is just perfect!! We all loved it. Such a strong flavour with so simple ingredients. I will place it on our weekly menu. We live in Europe, but we love to explore new flavours….so from now on -> I’m following you… Tnx for sharing ?? LOVE CHINESE FOOD, AND ESPECIALLY THIS SOUP, AND DO YOU HAVE A GOOD RECEIPE FOR HOT AND SPICY SOUP? HOW ABOUT SHRIMP LO MEIN? THANKS AND I WILL KEEP YOU POSTED. Yum! The first egg drop recipe I actually love! I used two cups of chicken stock so I did an additional two cups of water and a chicken boullion ! Also added mushrooms cucumber and celery. Very good. Thank you! Wondering if anyone has had success using ground ginger vs. fresh ginger in this recipe? My Dad wants to make this for my mom but he wants to use ginger powder (he’s 83 and doesn’t want to buy ginger root). How much ginger powder can he use that would be equivalent to a slice of ginger? Your recipe for egg drop soup is great. I would add one note: if you prefer the egg to not be small strands and instead some larger pieces, use two chopsticks to prepare the raw eggs. Put the eggs into a bowl and gently stir with the chopsticks, making sure not to mix too much. You should be able to still see some clear egg whites. Slowly pour this egg mixture from the bowl in the boiling soup while stirring the soup with the chop sticks. If the egg pieces are to large, then break them up gently with the chop sticks. The non-uniform egg in the soup makes for interesting textures. The ingredients call for white pepper powder, sea salt, and turmeric, but the instructions do not tell when to add those ingredients. Can you expand on the instructions to tell when to add them? Hi Gordy, sorry about that! I just updated the recipe. Oh yum! 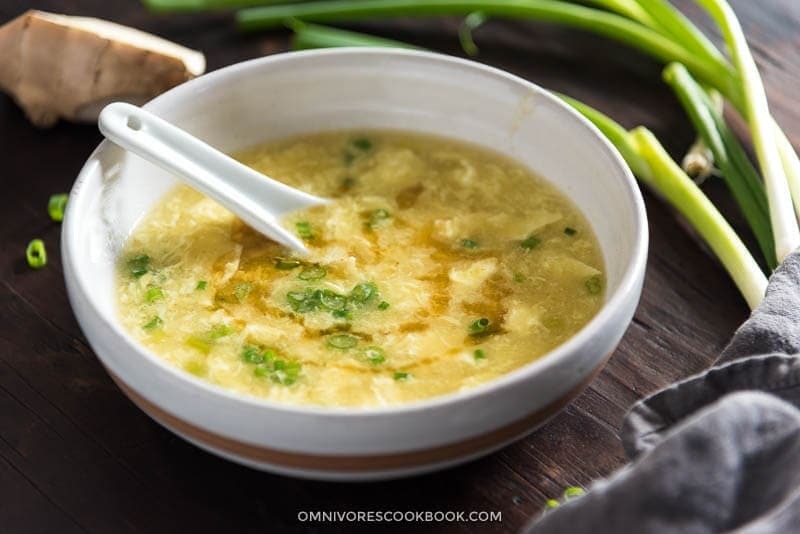 This is the BEST egg drop soup I’ve EVER had, thank you for sharing it! Adding my eggs was a little awkward, but that will get better with practice. Hi Maggie. Just want to say thanks for the recipe. I was looking for any fast soup recipe and came across your website. As I am writing this comment, I am eating the soup I just made from your recipe. I made a mistake because I didn’t scroll down (was in a hurry) and I actually MISSED the instructions! So I just improvised “how to do it”. I used two chicken fillet and also put some soy sauce. I missed the white pepper and the sesame oil. Anyway, it turned out really good. It’s not over tasty. I’m cooking this for my husband. And I am not actually a good cook. This is my first soup ever and I love it. A million thanks, Maggie! I just made this soup. It is so delicious. Thank you for sharing. Simple yet delicious! A big hit with young and old in our household…My kids request this soup often! No changes here, the recipe as written is wonderful. Thank you! When cooking Udon noodles I use the cooking liquid to make soups in this case I added dried ground vegetable bouillon before cooking the noodles! I’m a garlic lover that’s why also adding three sliced cloves, together with 1 slice of ginger, thinly sliced shiitake and chestnut mushrooms and the white parts of three scallions, simmered it for a few minutes then added the starch mixture and shortly afterwards the eggs! Cooked it for about half a minute before drizzling in the roasted sesame oil! Filled myself a huge bowl then I sprinkled really finely chopped scallions(green part) over the steaming hot broth! Tasted it and because I’m using low salt bouillon and didn’t added any salt I poured in a little mild Shoyu(low salt soy sauce) and the taste experience was extraordinary, really delicious! Thanks for sharing the recipe! The refried rice was a total success. My husband hates rice but he loves this rice! The bowl of egg drop soup is pure cozy perfection. Thank you. I halved the recipe for two servings and subbed vegetarian chicken broth for regular chicken broth. Maggie! I loved this (so did my family). I have been reading through all of your recipes and cannot wait to try them all out. We are an Asian food loving family (like driving an hour to get to Chinatown haha). I am really looking forward to cooking some good Asian food at home instead of going out. Thank you so much for your delicious recipes!! !